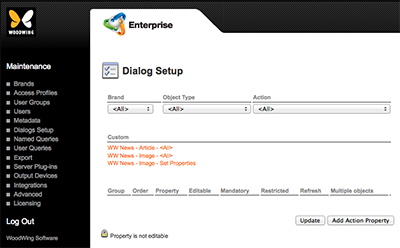 When Smart Image is going to be used in your company's workflow, and the 2 properties need to be editable by the users, the properties need to be added to the workflow dialog boxes for images (such as the Create Image and Property dialog boxes). Note: The action named 'Preview' and the actions that contain the word 'Query' are used for adding properties to areas other than dialog boxes and can be ignored. Group. Not editable. Shows the name of the Group as set on the Metadata Maintenance page for the property. This allows you to group together properties. When selected, the user will be able to edit the content of the item, for instance by editing the default value or by entering a new value. When not selected, the item appears unavailable (grayed out) and will not be editable by the user. This can be used for instance when a default value is given for a property that should not be changed, such as copyright information. When selected, the user is required to enter a value for that item. If no value is entered and the user attempts to go to the next step of the process (for instance by clicking OK button), a message appears informing that a value is required for that item. When not selected, the item can be left blank by the user. When selected, only users that have the option 'Change Restricted Properties' selected in their Access Profile are allowed to edit the item. For all other users, the item appears unavailable (grayed out). Multiple Objects. (Only when 'Set Properties' has been selected from the Action list) Select if the property should be available when a Content Station user wants to change the properties for multiple objects or files. Example: Making a field Mandatory but not Editable is not logical if no default value is provided. 2 Selected Selected Not selected Correct. It is good practice to make an item editable when also making it mandatory. 3 Selected Not selected Selected Correct. By setting Restricted, all users who do not have the option Change Restricted Properties set in their Access Profile won’t be able to edit the item, even when Editable is selected. Step 5. Click Add Action Property. A new row of options appear for adding the second property. Step 6. Repeat Step 4, but now choose Description from the Action list.